We at the PPCC are starved for documentaries, and so we gobbled up Rock School like a... a turkey (gobble, gobble!). 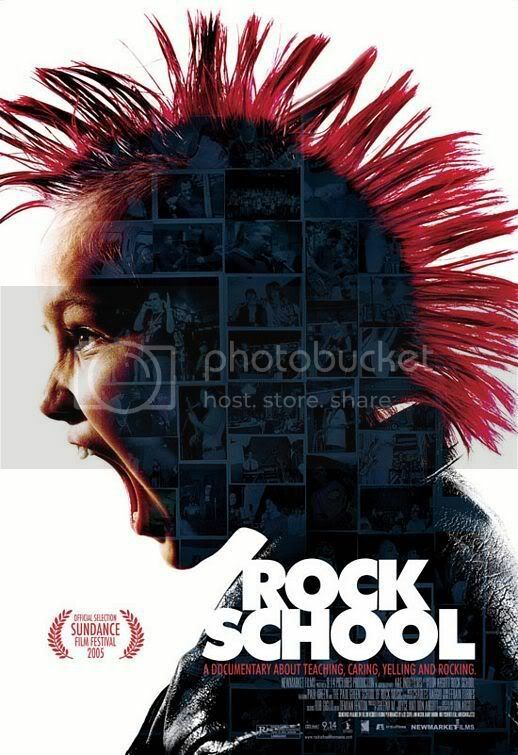 This brief and well-made doc follows the exploits of the teacher and students (aged 9-17) at the Paul Green School of Rock in Philadelphia. Established in 1998 by rock aficionado, Paul Green, its after-school program became a popular meeting point for self-described "misfits" and rock lovers. The documentary follows a group of young musicians as they rehearse power chords and stage presence in preparation for a series of concerts in tribute to Alice Cooper, Black Sabbath and Frank Zappa. The main "characters" in the film are Paul Green himself, the turbulent, egotistical, impassioned instructor; a pair of 9-year-old twins who aren't so great at music but perfectly embody the Rock Out! spirit (and are adorable, too! ); a prepubescent guitar prodigy; a depressed "coffee shop intellectual" 16-year-old artist; and a Sheryl Crow-inspired folky Quaker talent. The kids are a wide range of talent and temperament, yet they are all devotional to Rock School. Even if they're not the best musicians, they visibly thrive in the freedom and chaos of Rock School. One of the most controversial aspects of the documentary is Paul Green's teaching method - he berates, browbeats and screams. He makes inappropriate jokes filled with drug references, bad language and - to the depressed teen who's already attempted suicide several times - suicide. Yet Green insists that his method works, and most of the kids seem to do well. The documentary concludes with the kids successfully rocking out at the world Zappa festival, Zappanale, held in Bad Doberan, Germany, every year. We just love documentaries about subcultures - whether it's misfit kids learning to rock out or red light kids learning amateur photography or paraplegic full-contact rugby players. Rock School also touches on other interesting subcultures, apart from the 1970s rock lover hangover: for example, there is a brief sojourn in the youth Quaker movement - in particular, we spend some time with a group of Quaker rappers, the Friendly Gangstaz, who lay old school Quaker hymns over phat, hip hop beats. Since we at the PPCC are part of a subculture - the "non-Indian hipster intellectual blogger reviews Hindi movies" subculture - we feel a sense of community with these documentaries. When are they going to make a documentary about us, I ask?! SF360.org: Did you see School of Rock or Rock School? Thoughts? Johnson: Rock School’s Paul Green is the antithesis of what’s going on at Girls Rock camp—training [in a particular style] as opposed to nurturing creative expression and using music to, as Misty described it, give girls tools to make their own culture. Rock School is about carrying on a school of music that is already male. Touché! Indeed, considering that the male-dominated 1970s "glory era" of rock is what Paul Green is trying to indoctrinate the kids into (ahem, not everyone worships Zappa...) this seems like the natural direction things should be moving in: girls' empowerment and freedom of expression! We would love to see more of this. Anyone know about any documentaries on the riot grrrl movement? Or feminist hip-hop? OMG would this be the opportunity for the Missy Elliott/Anil Kapoor dream collaboration we often fantasize about?!! Huh huh BOUNCE bsshhhhhh... OMG CAN YOU IMAGINE?!?!! Timbaland/Missy/Anil Kapoor/A.R. Rahman/M.I.A./Arcade Fire/Arctic Monkeys - the PPCC would have died and gone to heaven!!! AIEEEE musicmusicMUSICMUSIC!!! And no, I don't know any feminist hiphop documentaries but I'd sure love to watch one! Esp coz I think female hip hop artists tend to have much more interesting stories than the male ones for a variety of reasons. Amrita - Totally! I heard they're making a biopic of Missy Elliott - can't wait!